My bro and I have gotten into the habit of embarking on little outings on Sunday afternoons - shopping, restaurants for lunch, that sort of thing - and last week we decided to head to Acland St, an visited an old favourite of ours, Leroy Espresso. Hehe, love it! Wish I could have had a sign like that at my previous jobs. Leroy Espresso offers friendly service, great coffee and yummy food. I am soo not, never have been, trendy/hippy/alternative/bohemian/cool enough for the St Kilda crowd, but I find Leroy to be refreshingly attitude-free. It used to be my family's regular haunt for weekend breakfasts about 4 years back, but we seemed to have stopped visiting after a while - I suppose it's because our conflicting work schedules made it increasingly difficult to organise family fun time, and St Kilda is a fair while away from our neck of the woods. I am happy to report it was just as good as I remembered. Latte! Check out the superdense foam... I think it was $3?? My bro Dan ordered the Spag Bol - "It tastes like the 70's". Price forgotten. And because too much is never enough, after hitting a few shops, we ended up at San Churro's for (duh) churros and chocolate. Classic Spanish Hot Chocolate (approx $5.50??) - dark and not too thick. I love the bulbous round mugs; it makes you feel like you're worshipping the gods of chocolate as you drink. Churros with milk chocolate - crispy donuts with an insaaanely good melted milk chocolate dipping sauce. Affogato - espresso shot over a scoop of white chocolate ice-cream. This was Su's order, not mine, but she said it was fantastic. 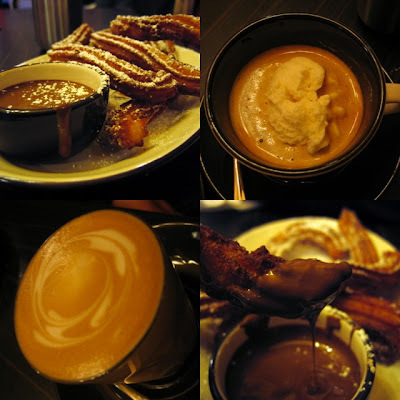 I'm sorry for being a total ditz about the prices - I'm guessing that the coffee was about $3, the churros would have been about $9, and the affogato around $4~5 but I can't remember exactly. Happy, super-full, and sugar-satiated, we made the long drive back to the eastern suburbs, all vowing that we'd be living on salads and fruit for the next week. Hah! Goodbye pile of food magazines dating back to 1999. Hello bedroom floor, which I haven't seen since at least 2003....! Is there a sight more beautiful than a big glistening pile of crispy roasted duck? Our favourite Peking Duck is at Little Beijing House, a semi-local, casual and friendly suburban restaurant. It is quite a small place, and is really popular, so I'd recommend booking. And, when booking it's usually a good idea to let them know you want Peking duck. We start off with free soup: pork, tofu, veggies, salty broth. I love this soup! Next come out the accompaniments - cucumber, spring onion, hoisin sauce. Next come the steamed pancakes, and a massive crispy roast duck, which our waiter skilfully slices into small pieces. I was too shy to take a photo of him in action, but you can see the fruit of his labours at the top of the post. 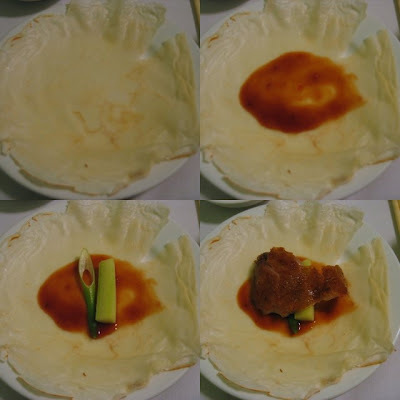 I think most readers of this blog would know how to wrap up a Peking Duck pancake, but here's a pictorial guide if you don't know, or if you haven't had Peking Duck before. (You sad, sad person. And why aren't you booking a table at your closest Chinese restaurant, now?). Then wrap it up and stuff this parcel of deliciousness into your mouth as fast as is humanly possible. Aside from being an enthusiastic Peking Duck eater, I am by no means an expert, or even an aficionado. I'm told that it's more authentic for the duck pieces to be more fat than meat, and super crispy. I, however, prefer the meatier pieces. So there. Left: Crispy and fatty. Right: meaty and juicy. At Little Beijing House, they will cook the remaining duck meat for you. You can choose to have it stir-fried with noodles, or with tau geh (bean shoots). Ordinarily, we'd go for the noodles, as my brother hates tau geh. On this night, it was just myself and the parentals, so we went for tau geh. Yum! We also ordered a sweet and sour pork dish to share, but after having shared a whole duck between 3 of us (oops), we were too stuffed even to consider eating it. At least there were leftovers for lunch that week, wahey! 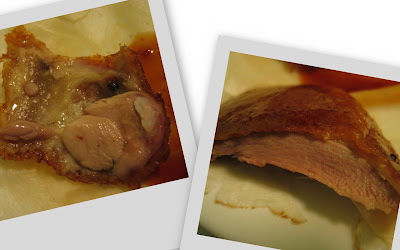 If you want Peking Duck to be the whole meal, then a whole duck between 3 would be fine. If you want to go the more trad route and have the duck as entree, then I'd suggest going for a more modest portion. I haven't had Thai food in aaages, so I was very glad when my friend Adri suggested Ying Thai 2 for a Sunday-night catch up. We rocked up at 6pm on a Sunday night, and it was a lot busier than we expected. We were told that we could only get a seat inside if we left by 7! It was warm outside, so we were happy to take an outdoors seat and relax. We ordered 4 dishes and rice to share between the 3 of us. I, being the devil-may-care rogue that I am, I was gonna ask for all dishes to be hot, but my friend Adri urged caution. The restaurant has a reputation for having their food hot hot hot. We asked for all the dishes to be medium heat. It was a good move. It was a bit of a struggle getting all the dishes/plates/cups on the table, but the waiters somehow managed. I must admit I nearly had a heart attack watching them carry piping hot pots of soup balanced precariously atop lit burners with one hand, but all food was ferried safely to the table. The picture you see at the top of this post is the coconut-milk free vegetable curry. Supposedly "medium", it was frikkin HOT!!! Tom-Yum Soup - richly flavoured, and just as spicy as I like it. Chicken Pad Thai - our favourite dish. They seemed to forget about our duck salad, but once we asked the waiter to check on it, it came out really quickly. It looked a bit disappointingly small, but it was so delicious! I loved the gritty contrast of the roasted rice and the tangy dressing. The whole meal ended up being good value, at around $25 each. I love Thai food, but don't often eat it here, so Ying Thai 2 was a great find. I enjoyed all the dishes, except for the veggie curry, which apart from being too hot for my taste, didn't complement the delicious tom yum soup - it was hot broth overload. Next time I'd definitely go for a coconut based curry. Oh, lecker! I was so incredibly pleased with tonight's dinner. Forgive me while I boast and gush. It was my turn to cook dinner tonight; it was cold and I really wanted proper home-style cooking. I decided on Sauerkraut and meat, the way my host-mama in Germany made for me. I didn't have a recipe, apart from the instructions: "just cook it all together in a pot with some Kümmel!" (A.K.A. caraway seeds). So, in the morning before work, I took out 2 Frankfurters, 2 Knackwurst and a piece of Kaiserfleisch from my smallgoods stash in the freezer, and let them defrost. Frankfurters are the thin ones, Knackwurst are the fat ones, and that delicious solid slab of porky goodness is Kaiserfleisch (aka the aptly titled "King Meat"). When I got home from work at 6:30pm, I rinsed a 680g jar of Sauerkraut, and fried the Kaiserfleisch on both sides until slightly browned, and set it aside. Then I tipped the Sauerkraut into the pot, and arranged my meat-products on top. I poured a teensy bit of water in there to prevent sticking, and plonked a lid on the top. Meanwhile, I made potatoes for Kartoffelbrei (mashed potatoes), and after about 30 minutes of simmering, the Sauerkraut was ready. All it needed was a generous sprinkling of Kümmel. In further support of the Kümmel argument, apparently Sauerkraut gives you gas, whilst Kümmel dispels gas. So there you go. Meat-Feast!!! One of the Knackwurst split during cooking, oops! Mashed potato/Kartoffelbrei. One of the best ways to eat one of the world's best foods. Immodest of me, I know, but this dinner was fantastich! The meat, from Andrew's Choice, was delicious. I was afraid that this uncompromisingly German dish might be a bit foreign for my parents' taste, (and I did rinse the Kraut very thoroughly so it wouldn't be too sauer), but they loved it too. Unsurprising though, when I think about it - Mum loves mashed potatoes, and being Chinese, they love their pork! It was a very rich and heavy meal, but so comforting, and perfect for sinking into at the end of a long week. No theme this week, just a selection of rather random dinners. Anyhoo, I made this sauce from my head, as a cross between Nigella's onion mush from How to Eat, and French onion soup. I sliced up a gazillion white onions using a mandolin, then sautéed them in some oil until soft and slightly brown. I placed a lid of foil right on top of the onions to keep the moisture in, and let them sit on a really low heat for about 20 minutes. Then I added a spoonful of flour, and some beef stock (made from beef-flavoured vegetarian stock cubes, to be precise), and let it thicken up over heat. I served the steak & sauce with some more salt-baked potatoes (make sure you prick them before baking. I forgot to do this and one exploded), boiled baby carrots and chive-flecked sour cream. That, my friends, is flavour country! This recipe, another Nigella one, comes from her tome Feast and is of the quick-prepare, slow-cook variety. Great for a weeknight dinner, if you're organised. Marinate the chicken the night before and bung the chicken with some sausages into the oven when you get home from work. An hour later, dinner is ready, with minimal after-work work on your part. (An hour may seem like a long time to wait, but I guess it depends on how hungry you are, and if you need to check your emails, take a shower or whatever.) And this is a really low effort dinner. I actually cooked up some petits pois and a makeshift dodgy potato gratin, turning the supper into a high effort exercise, but I think next time a green salad and some bread would be an easier option. The chickpea salad was leftover from a previous lunch, and to make the chorizo & spinach, I fried some onions in oil, then added slices of chorizo (from the freezer), and some baby spinach from the fridge that wasn't quite fresh enough to be used as salad. Ta-dah! A big batch of croissants was the highlight of my recent Brunch for Breast Cancer. The recipe came from The Roux Brothers on Patisserie book, my go-to text for all things French patisserie. The things I knock up in my kitchen will never, could never, be as perfect and gorgeous as the delicacies gracing those glossy pages, but it would be silly to let that stop me from getting stuck in and having some pastry-related fun! 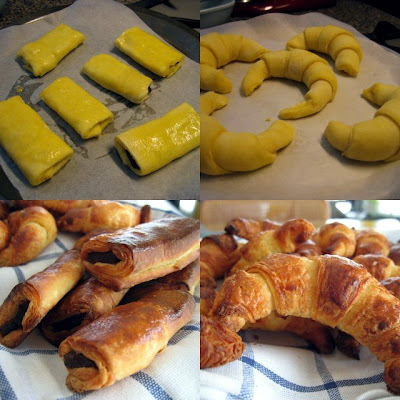 Making croissants is a long and tedious, yet rewarding process. You need lots of butter, lots of time, and lots of rolling and folding and resting and rolling and folding and resting to get all the pretty flaky layers. Remembering that making the croissant dough takes up the better part of a whole day, and that all yeasted dough can be frozen and defrosted successfully, I prepared the dough the weekend before my brunch. 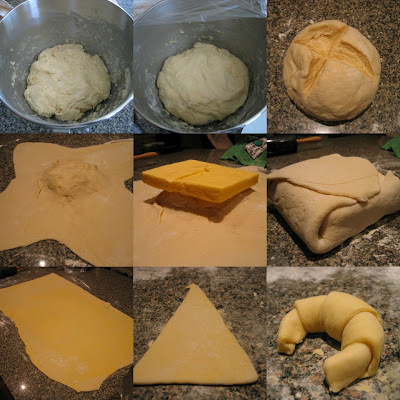 Once the dough is formed and risen (a 6-8 hour rise in the fridge), you form it into a ball, cut a cross in the top and roll out the edges to make a 4-pronged star shape. Place a block of firm butter in the centre, wrap it up in the dough, and start rolling. I can never quite get my head around that "turning" business, but basically what you need to do is roll the dough into a big rectangle, and fold it into thirds like a business letter. (The first turn). Then you cover the dough and let it rest in the fridge for 30 minutes. Then you take it out and do the rolling and folding thing again. (The second turn). Another 30 minutes in the fridge, then another turn. The waiting is a pain in the arse, but the rolling is great fun. I loved watching the butter distribute throughout the dough and seeing all the layers form. Then it is time to form your croissants! Les frères Roux instruct you to use an isosceles triangle template to maintain a uniform shape, but this didn't concern me too much, so I just winged it. I also made some pains au chocolat (P.A.C.s), in a none-too-fancy way. Just broke up some Lindt excellence 70% cocoa pieces and wrapped them in my buttery buttery dough. I wrapped the formed croissants/P.A.C.s carefully in cling wrap and foil, and shunted them into the freezer. My plan was to defrost them in the fridge overnight, and simply bake on the morning of my brunch. Given the time and effort invested in making the dough, however, I wanted to make sure I'd bake the croissants correctly. So, I did a couple of test runs throughout the week. (They only take 15 minutes to bake in a hot oven, so that was fine to do while I got ready for work in the morning). I took one mini croissant, one regular croissant and one P.A.C. out from the freezer, placed them on a lined baking tray and let them defrost in the fridge overnight. In the morning, they hadn't risen very much, but I baked them anyway. Taste was good, size was small. This time I let the croissants defrost overnight at room temperature. Success! They rose satisfactorily overnight, and made decent-sized croissants. As you can see, I didn't glaze them. It would have been a waste of a whole egg just to glaze 2 croissants. I let the raw croissants defrost overnight at room temperature, then glazed them with egg-wash and baked them! They got brown very quickly, and I was scared that baking the croissants for the time specified in the book (18 minutes for the P.A.C.s, 15 for the croissants) would leave my little pastries burnt, but they turned out fine. Keep an eye on them though, especially if your oven, like mine, is on the hotter side. My P.A.C.s were a bit long and thin, but at least my croissants were normal-looking! The taste was good too - buttery and flaky. The croissants were nice to eat just plain, but a smear of strawberry jam (confiture aux fraises de Bonne Maman, naturellement) was a great accompaniment. Fab recipe! The Roux Brothers do it again. There's no way that I, with my rolling pin and homebrand unsalted butter could compete with a professional baker, but I was proud of my achievement all the same. Nothing beats a fresh, hot croissant straight out of the oven, wonky shape or no. Like croissants? If you would like to sponsor me and make a tax-deductible donation towards the national Breast Cancer foundation, please click here.